In what seems to be a new Cloud Dance Festival tradition, once again we bring you Cloud Dance Friends, an adhoc show celebrating some of the most highly-praised work of the past year and new work by friends of Cloud Dance Festival - as well as lots of cake, apparently. Regent's Place, London, NW1 3BF. Soon after last year's Cloud Dance Friends show, I moved to Newcastle, and when you're 300 miles away from London, not only do you end up missing a lot of shows, you get to hear all the buzz about the shows which really stood out. Yukiko Masui, Mike Williams and Estela Merlos are three such artists, and so this show is a very selfish means to see the pieces by them which I'd missed earlier this year. Anyone who watched BBC Young Dancer on TV earlier this year will (hopefully) remember the lovely duet between Jacob O'Connell and Jason Mabana, choreographed by Jason, who is now a dancer with Shobana Jeyasingh Dance Company, and we're really pleased to be able to offer you another chance to see this duet, in a far more intimate setting. 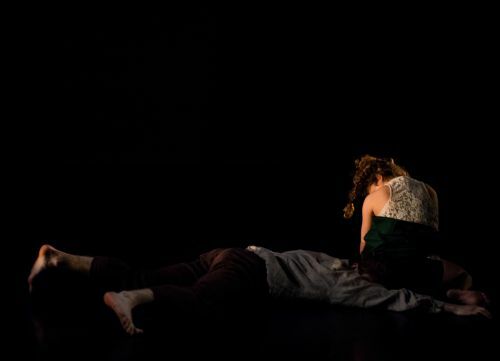 We're also very happy to welcome back the extremely talented Cloud Dance Festival alumni John Ross Dance and Anna-Lise Marie Dance, and we're very grateful that they'll be sharing new work with us: in fact, John Ross will be sharing a taster of his latest work, because it's so new. Elise Nuding is not new to Cloud Dance Festival, having written for us for several years, and this is the first time she will share her very individual and intriguing work with us. Finally, it wouldn't be possible to hold any such celebration without the involvement of Humanah Productions; besides being the ideal piece for a show like this, they've been important to me over the past year. So it's my birthday, and I'm putting on this show because I really really want to do something special with my London friends in the dance industry - partly because I idiotically decided a year ago to live so far away, and also because I've been so ill for most of this year. But for people who don't know me personally, I wanted to put on an evening of high-quality work by independent dance artists at a great little venue in central London for everyone to enjoy. Come along and join us - and stay for a slice of cake, please. Tickets can be bought online from newdiorama.com/whats-on/cloud-dance-friends or over the phone at 020 7383 9034, and if any tickets are still available, on the door before the show.